When Richard Widmark’s yoga teacher took a photo of him in Moon Pose recently, Widmark’s reaction was one of disgust. The 38-year-old Virginia man, who weighs almost 700 pounds, writes that he didn’t see what his teacher saw. With the help of yoga, Widmark has begun seeing the value of his body and is becoming an inspiration to others as he documents his journey. 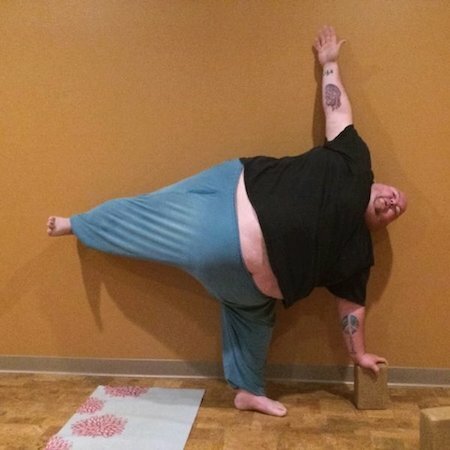 He proves that anyone of any size and shape can do yoga and feel great about themselves. “Years of hating myself won’t go away over night, but with the help of supportive friends, I’ll get there. Yoga is for EVERY BODY,” Widmark wrote on his Facebook page. There he posted the photo that has since gone viral with over 7,000 shares and even more positive comments. The response to the picture has made him want to “continue his journey,” according to the Daily Mail. Widmark, who has been taking private yoga lessons twice a week for the past two months, has already lost about 20 pounds, but that pales in comparison to what he’s gained: self-esteem. After battling depression and attempting suicide, he turned to a raw food diet, which led to yoga—and a whole new lifestyle! According to YogaDork, Widmark chose yoga because he wanted to be encouraged rather than disciplined or shouted at in a “boot camp-style” fitness class. 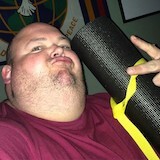 He believes that it’s hard for overweight people to start yoga because of its “beautiful body” stigma and its “seemingly next to impossible poses,” but would like to start seeing more people of different body types doing yoga.